Sign up for the CHQ Newsletter to stay on top of all our exciting performances and to get a closer glance into the lives of CHQ members. We are excited to announce the release of our second album "Dance Sketches" in April 2018! This CD took a lot of hard work and we are proud to announce that it is comprised of almost all original works written for Harp Quartet (plus a few of our most favorite arrangements). This is a huge achievement for us and for the harp community. Five years ago, this type of CD would not have been possible. Since our foundation, the repertoire for our unique ensemble has grown tremendously, providing us with the opportunity to record some wonderful original harp quartet music. This CD is entirely self-produced. You can imagine this is an extremely expensive endeavor. If you'd like to get involved to help support the release of the CD, please get in touch or simply go to our website to Donate. If you pre-order online before March 30, 2018 you will receive a signed copy of Dance Sketches! The start of a new year is a great time to look back at the past and look forward to the next. When looking back on 2017, we're really proud of what we've accomplished. Here's a snapshot of our exciting year. Fundraising over $20,000 lead us to be able to travel to Havana, Cuba, donate two harps and bring a huge donation of strings, music and supplies for the harp community there. Our first community project made possible by the support of amazing donors! July 27, 2018 Concert in LaCrosse, WI. July 28, 2018 Concert in Winona, MN. July 29, 2018 Concert in Viroqua, WI. Member's thoughts: The ending of a great year. Julie’s 2017 highlights included playing backstage harp at Lyric Opera of Chicago, accompanying Matthew Polenzani in Bizet’s Pearlfishers. Her sidekick, Dax (5), entered Kindergarten, as well as debuted in his first piano recital around Halloween - dressed as Ironman. 2017 was an joyful year for Lynn, welcoming her daughter Lucille Grace Claxon-Williams in August. The year included many exciting performance and teaching opportunities including a concert on PBS Great Performances with the Lyric Opera of Chicago in the World Premiere of Jimmy Lopez's opera "Bel Canto," and a Master Class at the Summer Institute of the American Harp Society. 2017 was the year of change for Catherine, and since moving to Los Angeles, CA she has been able to spend more time with family and has since started to learn floral design. She has continued performing chamber music and orchestra music in CA and most recently performed and recorded the world premiere of a piece by James Tenney "64 Changes for 6 Harps." Since Emily’s move to Australia she has performed with the Sydney and Tasmanian Symphony Orchestras, Opera Australia Orchestra and Orchestra Victoria (Melbourne). She adopted two kittens, Marcel and Fausto, is planning to walk across Spain on the Camino de Santiago this December and is obsessed with flat whites. Looking for a worthy cause for your year-end Donations? Please consider donating to the Chicago Harp Quartet and know that your generosity goes towards supporting a small, arts non-profit where every dollar matters. Thank You to Lyon & Healy, ALG Worldwide and Bow Strings! Calling all harpists & technicians! We need music, strings, and more by April 24th! Can't make it to the concert but still want to help? We invite you to join us for a fundraising concert to benefit our musical ambassadorship to Cuba in May 2017! All donations go directly toward our Cuba project and will be used to bring vital supplies and resources to the harp community in Cuba. CHQ is traveling to Cuba May 29, 2017 for a residency at the Cuban Music Institute in Havana. We will be teaching master classes, leading an educational session for youth orchestra students on creative ensembles, performing with the youth symphony, performing our own feature concert, and bringing supplies and harps to help bolster the harp education resources at the Cuban Music Institute and throughout Cuba. What is the current state of Harp Education and Performance in Cuba? There are very limited resources to play, practice, and learn harp in Cuba. Mirtha Batista is the only harp instructor in all of Cuba, and the number of functional harps is minimal. There are only 4 pedals harps in the whole country of Cuba, and they are in dire disrepair. We met our connection to Cuba - Anabel Gutierrez Orraca - during our residency at Indiana University. The Cuban government is (partially) sponsoring her education at IU to aid in her ability to come back to Cuba and enrich the culture with more harp knowledge, history and educational abilities. A very big thank you to Lyon & Healy Harps, ALG Worldwide and Bow Brand Strings for your generous support! and are asking YOU to join our cause. Tax deductible monetary donations can be made through our website or mailed to the address above. Can't make it to the fundraising concert but still want to contribute? Give to our Crowdrise Campaign! We're excited to kick off the season with two additions to our quartet. We've hired a new Office Manager and got exciting news about our newest member. In addition, you'll find info about upcoming performances around Chicago and elsewhere, Enjoy! We were sad to say good-bye to Kelsey after last season, but it is with great excitement that we introduce to you our new 4th member, Julie! Kelsey just welcomed her second child, Michael into the world July 23. He weighed 8 pounds 9 oz and is adored by his older sister, Maria. We wish Kelsey all the best and thank her for her time and commitment to the quartet over the last couple seasons. Julie and her little man, Dax, moved to the suburbs of Chicago this month after living and working as a harpist and educator on the East Coast for the past several years. We are so excited to have Julie joining us as a full time member this season. She subbed with the quartet during the 2014-15 season, flying into Chicago all the way from Hartford for all of our concerts and projects. Julie performed with us at the Lyon & Healy 150 year Birthday Festival, Fischoff International Chamber Competition and as soloists with the International Chamber Artists. We all developed a deep working relationship and are happy to have her living in our great city. Her extensive background as a soloist, chamber and orchestral harpist makes her the perfect addition to the quartet. "I'm excited to be joining the Chicago Harp Quartet as a full-time member this fall. We all had a great time working together in 2014, and I have no doubt that the fun will continue! Kelsey is a fantastic harpist, and I hope that she continues to enjoy her family and her career around Milwaukee. She will be missed! The past two years, I have been working both as public-school educator as well as principal harp of the Hartford Symphony orchestra. I have done numerous chamber music concerts around Hartford as well as Boston and really enjoyed my time in New England, though it is a great dream fulfilled to come home to Chicago. I have just moved with my son, Dax, to the Lombard area. We are enjoying getting unpacked and ready for school to start this fall. Biking is a passion of mine. I finished a 155 mile bike ride for diabetes this summer, as well. Please also welcome to the CHQ family our new Office Manager, Jennifer Fiske! Jennifer will be taking over a large portion of roles here for the CHQ and assisting her will be Mirela as our Office Associate. We are so thankful to have these talented ladies on board to help us achieve all our musical and artistic goals. It is often overwhelming how much work goes into maintaining a chamber group and nonprofit organization in addition to performing. Jennifer Fiske grew up in northern Illinois and graduated from Northwestern University and the University of Wisconsin. She has experience in event coordination, both artistic and corporate, as well as corporate management. She enjoys travel, fishing, bird watching, books, winter and of course music! As a former horn player, her favorite pieces are determined by “anything with a good horn part”, but that’s about to change! She lives in Woodstock, Illinois, with her Cats Cassidy and Louie. The Nashville Chapter of the American Harp Society in partnership with Vanderbilt University’s Blair School of Music proudly present the Chicago Harp Quartet. CHQ will also present a masterclass the following day, September 11th, at 2pm in the Choral Hall. CHQ will be giving the World Premiere of a work by Chicago composer Carolyn O'Brien at Chicago's very own festival of New Music: Ear Taxi. This festival combines the efforts of 300+ musicians, 86 composers, 25 ensembles, 53 World premieres, 4 sound installations and much more to celebrate Chicago's vibrant and booming contemporary classical music scene. We are so excited to be working with Carolyn O'Brien on her composition for Harp Quartet. Northmoor Country Club presents a Fall Chamber Concert and Dinner featuring the Chicago Harp Quartet. Reservations are limited through the Country Club and include Cocktails, Concert and Dinner. The Northwest Suburban Community Concert Associations presents the Chicago Harp Quartet. The Northwest Suburban Community Concert Association has a 68-year history of bringing affordable, high caliber entertainment to the Northwest suburbs. This all-volunteer non-profit organization sponsors five concerts each year featuring national and international performers. Tickers available online here or at the door the day of the concert. From March 27 through April 2, the Chicago Harp Quartet will be embarking on our first Midwest tour. Please help spread the news! Each member of the quartet maintains a busy performing schedule in addition to performing with the quartet. Please join us at an upcoming performance in the Greater Chicago Area. The Chicago harp Quartet strives to present the highest quality performance of chamber music in both traditional and non-traditional venues, to be ambassadors for the harp, role models for young harpists, and trail blazers for new and unique ensembles. If you, or anyone you know would like to get involved we would love to hear from you. Please be in touch! Long Awaited Spring is Here! The weather is warming and the city is awakening to a whole new season of music making. Our quiet months are running out of days and in less than a month we'll be back in full swing playing 4 harps, 28 pedals and 188 strings! The month of April will be packed with concerts and something to speak to every music lover, whether it’s a noonday concert in the heart of the city or an enchanted evening in an art exhibit enveloped in the golden sounds of the harp. We hope to see you at one or more of our upcoming concerts, or visit us on our Facebook page for updates and exciting news! Join us for our upcoming concerts! If you are unable to attend our upcoming concerts but would still like to show your support for the Chicago Harp Quartet, please consider making a tax deductible donation today! We would like to extend a warm welcome to our newly elected board president, Danielle Braff. A freelance writer and editor who covers everything from travel to parenting to business and the arts. Her deep interest in the fine arts and support of female organizations make her the perfect candidate for the position and we are very fortunate to have her. "I've been a fan of the Chicago Harp Quartet since the first time I saw them perform. Their breadth of repertoire, from traditional harp music to pieces transposed for the quartet, to music that Lynn composed specifically for the Chicago Harp Quartet - makes every concert super exciting. What's also evident is the connection that each woman has with each other, which is so rare, and which makes this quartet work so well. " We'd like to take a few moments and introduce you to our associates across the Atlantic, the London Harp Quartet. Founded in 2015 by alumnae from the Royal Academy of Music under the artistic direction of Skaila Kanga. "Our debut season opened to packed enthusiastic audiences in some of London's most prestigious venues including St Martin in the Fields, Trafalgar Square. The theme was 'Dance' and Richard Bissill's Three Dance Sketches received its world premiere alongside works by Bruce Broughton and Paul Patterson and arrangements kindly shared with us by our associates the Chicago Harp Quartet. For next season we have commissioned a new work by Christopher Gunning and are planning performances at major festivals across the UK. Judging from the reaction to the group this year we are all hopeful that this will be a real success story. We thank the CHQ and all our supporters for their help and encouragement in our new venture." 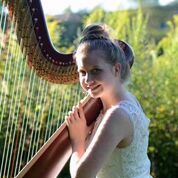 A participant since 2011 and returning student of the Chicago Harp Ensemble, 13-year-old Zoe O'Shaughnessy shares some thoughts about her time at CHE. Emily was invited by Australia's leading recorder player, Alicia Crossley, to perform a month long tour consisting of concerts in Sydney, Canberra and Bellingen. The recorder and harp duo, Duality, performed concerts, gave school presentations and was featured in an interview on Fine Music Radio. The duo commissioned new works by Australian composers Mark Oliverio, Andrew Batt-Rawden and Tristan Coelho. The final performance was given at the Sydney Opera House. Read the stellar review here. Emily then traveled to New Zealand to walk the world's newest long distance trail, Te Araroa. This trail is over 3,000 km long from the top of the North Island to the bottom of the South Island covering long and traverses high mountain tops, volcanoes, river valleys, farmland, and everything imaginable in-between. Emily's through "tramp" as they call it in NZ, took 138 days. "The biggest misconception about the Te Araroa is that being in New Zealand, known for its “Great Walks,” this must be easy tramping. That’s wishful thinking. The TA mostly takes the rugged path, overlapping with just two of the nine Great Walks. The best way to describe the trail quality is “mixed”: one minute you’re slogging up and down near-vertical muddy slopes with the biggest tree roots you’ve ever seen, and the next you’re channeling your inner mountain goat on a six-inch-wide trackless scree path, nothing below but imminent death." CHQ in a Winter Wonderland! Last week, on November 18, the Quartet celebrated our 3 year anniversary, a realization that even took us by surprise! We are excited to have covered so much ground and to have developed the concept of the Quartet into a non profit organization over this time period. We cannot thank our donors and supporters enough for their continued dedication and support, which are the wings that empower our vision for the harp and classical music to take flight. We are passionate about what we do; educating, bringing the highest quality of chamber music to Chicago and across the United States, and expanding the harp quartet repertoire. One of the ways you can partner with us in this mission is through a tax deductible donation of any amount. Donate today! On Sunday, November 15th CHQ’s student ensemble, the Chicago Harp Ensemble, participated in the Harp Day member showcase concert organized by the Greater Chicago Chapter of the American Harp Society. This ensemble provides rare and valuable experience to young aspiring harpists by helping them mature into well trained and competent ensemble musicians. Know somebody that could take advantage of this great opportunity? Enrollment is now open for the spring semester! at Lyon & Healy Hall on December 6, 2015 at 5:00pm, where the Chicago Harp Ensemble will be presenting their Winter concert including classical favorites and Holiday selections. The concert is free and no tickets are required. Come to enjoy the music, and show your support to a growing generation of harpists and musicians! Looking for that perfect gift or stocking stuffer? What if this year you give the gift of music while supporting your one and only favorite harp quartet? Order the CHQ CD today! 1| Work as hard as you can when you have the time! I'm all for a great vacation, especially somewhere warm during our long Chicago winters, but absolutely believe the harder you work the more luck you will have in your career. 2| Always have a goal in mind. This includes learning and performing music for concerts, auditions and competitions, as well as thinking about ways the harp could evolve in my life. I'm a 'Project Person' and love a good challenge. Some of these projects have included the creation of the Chicago Harp Quartet and Chicago Harp Ensemble, publishing over 100 works for harp, and a solo Christmas CD. 3| Stay organized! I currently have four jobs (Private teaching, Roosevelt University, Chicago Harp Quartet and Lyric Opera of Chicago), each one of those has its own set of requirements and keeping everything organized is a must! How did you find your way to the harp? I come from a musical family. Both my sisters and I studied piano starting at 5 years old. Throughout school I tried many other instruments, but it wasn't until I was 14 that I had the opportunity to try the harp and instantly fell in love with it. My mother had always dreamed of playing the harp (she played piano and later became a music educator in public schools) but her family could not afford one. When her mother passed away, she left money earmarked for the purchase of a harp. That harp still sits in my studio today, in fact I played the Brahms German Requiem on it last week! What do you enjoy doing when you're not behind a harp? I truly enjoy traveling and exploring foreign culture. My husband and I finally went on our honeymoon this past July and on the flight back made a list of all the places in the world we need to see. This year we'll be heading to Puerto Rico for a little Winter thaw-out, and to Thailand in the Spring. I'm also trying to organize a Dude Ranch vacation with my two sisters! I love cooking when I have the time (which is't that often). Being raised a good Southern Lady, I love to make traditional Southern dishes, but also like to branch out into other ethnicities. Recently I discovered Delicata Squash and am currently obsessed with it! Finally, my husband Donald and I welcomed an 8 week old puppy named Dante into our home this past August. 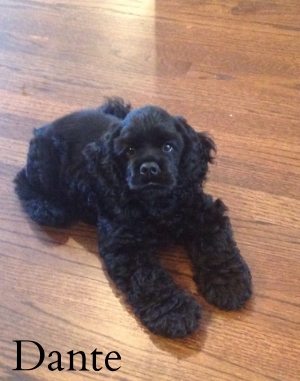 Dante is a solid black American Cocker Spaniel who loves to get into all sorts of trouble! Both Donald and I grew up with Cockers and are so happy to finally have our own! Lately our favorite outings have included going to one of the many City of Chicago dog parks where Dante races around keeping up with all the rather large dogs. It is with your support that we can continue to commission new works, accomplish our educational goals training young artists, and passionately pursue collaborative projects with other art forms like our recent project with Mozawa. Please consider donating to the Chicago Harp Quartet to help fund our many projects, we are grateful for your support. CHQ is delighted to be starting the 2015-16 season with an opening concert taking place at Indiana University, presented by the USA International Harp Competition on Friday, September 4th. It is an honor to be presented by such an important organization for harpists around the world. The USA International Harp Competition is first and foremost a world-class international harp competition held at Indiana University every three years since its founding in 1989. Their goals include promoting and fostering the careers of gifted young harpists from throughout the world, promoting the harp as a concert and solo instrument, introducing the harp repertoire to a broader public, encouraging composers to write new works for the harp, and to fostering friendship and understanding among harpists worldwide. It is an incredible opportunity to work with an organization which shares common core goals with the mission of the Chicago Harp Quartet. Our September 4th performance is part of an educational residency taking place at Indiana University where we will present a workshop for the harp class, do a presentation for Project Jumpstart on starting a unique chamber ensemble from scratch, and perform in public schools as part of the Harp Start Project. We are thrilled to have the opportunity to share our music and passion with the IU and Bloomington community! September will be a busy month for us as we participate in the educational residency at Indiana University September 2nd through the 5th, followed by the Dame Myra Hess Memorial Concert at the Chicago Cultural Center September 9th. You can listen live to this concert online anywhere in the world at www.wfmt.com at 12:00pm CST. A few days later we hope to see you at our 2015-16 Season Fundraiser on September 12th! If you cannot make it to see us at our Fundraiser, join us September 13 at the Norton Building Concert Series in Lockport, Illinois. After our whirlwind of concerts in September, Emily will be headed to Australia for a concert tour titled “Duality” with Alicia Crossley, Australia’s leading recorder player. The highlight of the tour will be Emily’s Sydney Opera House debut, and conclude with an attempt to backpack 3,000 km across New Zealand via the Te Araroa trail. Meanwhile, the rest of the Quartet will be busy with the beginnings of symphonic and opera seasons, starting out the academic year teaching, and coaching the Chicago Harp Ensemble. This season is the 6th for the Chicago Harp Ensemble, and with Lynn’s appointment as Head of the Harp Department at Roosevelt University, we will be moving our permanent home to Roosevelt! Registration is now open through September 7, 2015, and the first rehearsal is on September 19. We are happy to announce four important new appointments to the Chicago Harp Quartet team. Mirela Shendrya has joined us as Office Manager to help keep the Quartet organized and functioning smoothly. 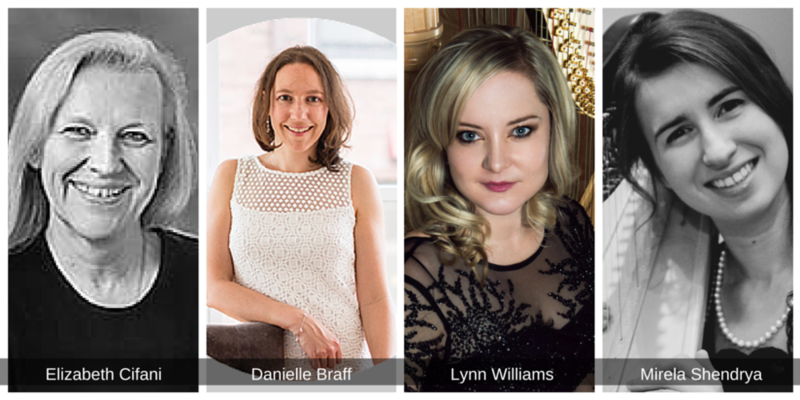 We are thrilled to announce the first two members of the Chicago Harp Quartet Board of Directors: Elizabeth Cifani and Danielle Braff. Finally, Lynn has been appointed General Director of the Quartet. And since we said it, what is your favorite coffee? ...my favorite coffee right now is Tanzania Peaberry! What have you been up to lately besides CHQ concerts? I am very excited about officially launching my Cello and Harp group, Duo Pacifico! We are currently booking concerts and have a GroupMuse performance scheduled for Oct 25 which I am very excited about! What is Groupmuse? Groupmuse is a wonderful initiative to bring classical chamber music back into an intimate setting, like a home, just like in the times of Haydn and Beethoven. If anyone is in the Chicago area, feel free to attend! In addition, I am planning a vacation to Portugal that I can't stop thinking about and planning for. Sometimes you almost end up having to force yourself to take a vacation because too often life gets in the way and before you know it, you haven't had a day off in far too long. What is your go-to post performance beverage? A glass of Buffalo Trace, with 2 ice cubes. ...and we've got so much to tell you! With the weather getting warmer and strings breaking every week, we couldn't be more excited about what we have coming up. Our concert on May 31, 2015 at the City Winerymarks our first ever Summer Concert Season with multiple performances in the Chicago and Washington, DC areas. In just a couple short weeks all four of us will be flying to Washington, DC for our debut performance at the Kennedy Center. We will perform on the Millenium Stage, presented by the YoungArts Foundation of which Lynn is an alumni from 1997! Next we will return to Chicago for concerts at the 2015 Lyon & Healy Summer Concert Series, Chicago Botanic Garden and an incredible collaboration performance project with Mozawa from July 30 to August 2nd. We are now officially a Nonprofit Organization! While we always have multiple ongoing projects, we are starting a fundraising effort to help produce our exciting project with Mozawa. Read more about this project below, and to donate, please click here. 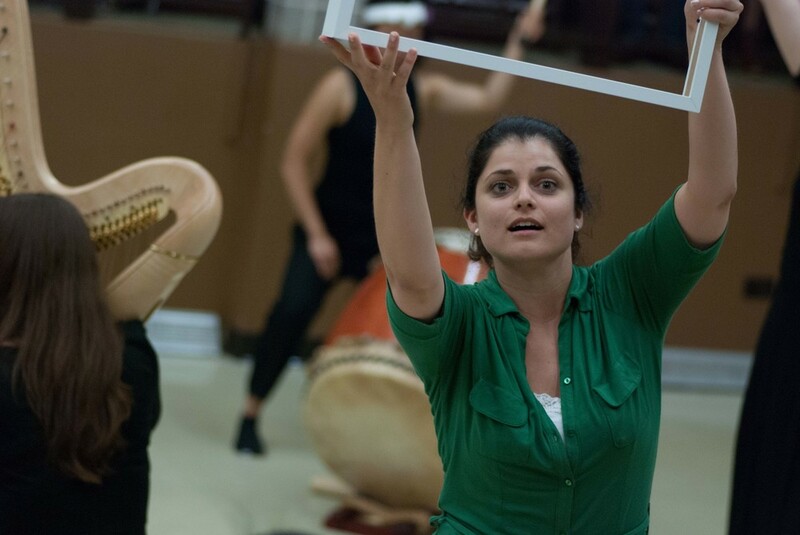 This July, the Chicago Harp Quartet will be joining Mozawa and Ho Etsu Taiko for a brand new, interdisciplinary performance project. We are currently fundraising for these exciting performances and need your support! Every little bit helps! To donate, please click HERE. What is Y Portraits: Awakening? The Millennials have been called “The Peter Pan Generation” due to their apparent unwillingness to grow up, “Generation Me” for their obsession with social media, and “Generation Y” merely because they follow “Generation X”. But do these labels capture the intelligence, passion, and variety of an entire generation? In Y Portraits, a collection of international Millennial artists will each develop a self-portrait in their chosen medium, including live dramatic and musical performance, visual art, sound, and film. Through this interdisciplinary artistic exploration, Mozawa presents a new vision of the “Y Generation. The performances will include a curated experience in which audience members will move through a large performance and art space to experience numerous types of art and artists both performing individually and interacting with each other. The Chicago Harp Quartet began this project last June in a workshop with Ho Etsu Taiko and Mozawa in which we worked together for the first time. The workshop produced a thrilling performance including collaborations in every possible combination for the three performance groups. Our favorite experience was adding Taiko drumming to Lynn's composition Musings. Now every time we perform it without the Taiko drums, we miss them! We are thrilled to have the opportunity to be a part of this very exciting performance venture, but cannot do it without financial support from our fans and donors. Please consider giving a donation in any amount to the Chicago Harp Quartet to help make this opportunity possible. Tell us a little about what you’ve been up to outside of the harp? I recently got into weightlifting, boxing and running. I absolutely love boxing! Something about being free to use all your force to hit something as hard as you can is extremely liberating to me, maybe I should have been a percussionist... I’ve found that exercising has directly impacted my harp life in a huge way. I had been suffering from tendentious for almost 15 years. I spent years in physical therapy, while also seeing an acupuncturist and massage therapist. After I got past the worst of it (around junior year of undergrad) I survived on monthly trips to the massage therapist. Since starting a regular exercise routineI’ve had the least amount of pain from playing the harp and even stopped having to see a massage therapist! I also recently started a new blog for the Harp Column Magazine. Check it out! What has been your favorite CHQ performance so far? There have been so many amazing performances it’s hard to pick just one! One of my favorites was our performance at the Lyon & Healy 150th Birthday Festival. We had some really important harpists in the audience that heard us live for the first time including my undergraduate professor, Susann McDonald. What a joy it was to look into the audience and see her there! First up on the list is our first ever East Coast Tour. We are off to Philadelphia on March 22 for an educational residency with Play on Philly! including several school visits and a performance with POP Harpists and Elizabeth Hainen, Principal Harpist of the Philadelphia Orchestra at the Curtis Institute of Music. On March 26th, we head out to New York City for a jam packed weekend of events including our debut at Carnegie's Weill Hall! Lynn will give a Master Class for the Metro Harp Chapter of the American Harp Society, the Quartet will have another educational residency, this one at NYU, and finally a concert with Duo Scorpio at the DiMenna Center for Classical Music on March 28th. Find out more details of all the events, and get your tickets for the DiMenna Concert through our website. As soon as we return, the Chicago Harp Ensemble will hold its Spring Concert on Saturday, April 11th at St. Gregory the Great Church in Andersonville. The students have done a phenomenal job this semester preparing for this event. The concert is free and no tickets are required. We hope to see you there! 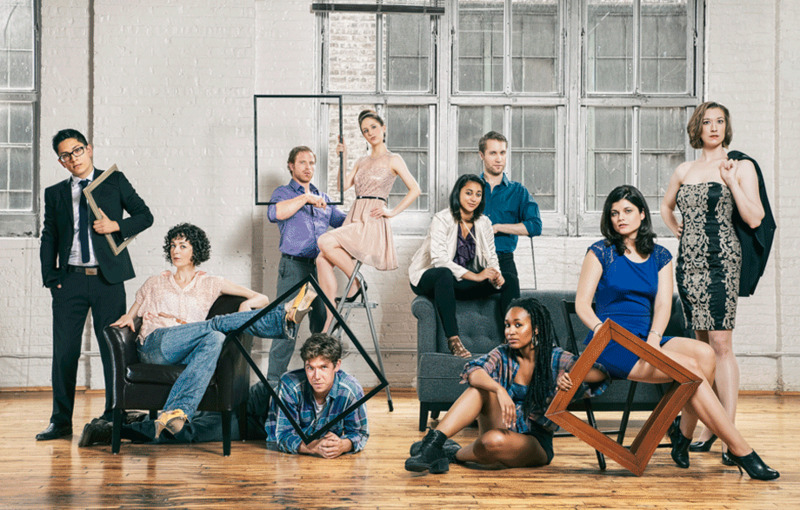 CHQ is very excited to announce our first summer season including concerts in Chicago at City Winery(5/31), Lyon and Healy Hall(7/10), the Chicago Botanic Gardens(7/28), and a week long run of Y Portraits: Awakening(7/30-8/2). Y Portraits: Awakening is an interdisciplinary art gallery experience collaborative project with Chicago based theater company Mozawa. In addition to these concerts, we are very proud to be making our Kennedy Center debut on June 21st at 6pm, presented by the YoungArts Foundation! In other business news, we are now officially a 501(c)3 non-profit organization! We are working hard to establish our Board of Directors as well as organize for fundraising. Our first ever Season Preview & Fall Fundraiser will take place on Saturday, September 12th. Save the Date! After moving through the snow all winter, we sure are glad Spring is here! Raised in Thiensville, WI, Kelsey Molinari began studying harp at age 11 and quickly became one of America's most in-demand harpists. She has performed around the World with top Orchestras including several tours with both the Los Angeles Philharmonic and Chicago Symphony Orchestra. She is on faculty at the Wisconsin Conservatory of Music and performs regularly as second harpist at the Lyric Opera of Chicago. Kelsey resides in Milwaukee, WI with her husband TJ and beautiful 1 year old daughter, Maria. In her free time, she enjoys cooking, golfing with her husband TJ, and spending time with her extended family. We are extremely excited to announce that we will be performing at the Kennedy Center in June 2015 presented by the National YoungArts Foundation! This will be our Debut at the Kennedy Center and we are so honored to be supported by such an amazing organization. For a complete list of our 2015 concert season please visit our website:www.chicagoharpquartet.com or see the list below. The Chicago Harp Quartet would like to invite you to a very special concert experience on Monday, January 12th at the WFMT Radio Studios. We will be performing a LIVE from WFMT radio broadcast concert from 8-10pm and would like to invite you to attend the broadcast in the Studio! Seating is limited, so be sure to RSVP no later than January 8, 2015 to Emily at chicagoharpquartet@gmail.com to confirm your seat. This event is not open to the public and you must RSVP in order to attend. Don't know what to get your loved one for Christmas? How about a lovely Chicago Harp Quartet CD! They will be humming our tunes long into the new year. CDs are available through iTunes, CDBaby or our website. Tickets and info click here. Members only concert and luncheon. More information and tickets click here. Thank you for all your support and love. Please continue to share our music andHappy New Year!! Welcome to our first ever newsletter! We hope everyone has had an enjoyable summer, we surely have! Rehearsals have started again and we are getting excited to announce our 2014-15 Concert Season. The most up to date list is below, but we'll be sure to update you as more performances are announced. We would like to formally welcome our newest member to her first official season with Chicago Harp Quartet, Kelsey Molinari! Kelsey has an extensive performing background and we are absolutely thrilled to have her as our new member. You can read her bio on the Quartet's website. We are proud to announce that we will be making our New York City Debut at Carnegie's Weill Hall on March 26, 2015! While in New York, we will also be performing with the outstanding Duo Scorpio, visiting the Harp Department at New York University and working with the Metro Harp Chapter of the American Harp Society. In addition to our visit to NYC, we are working to present several events in Philadelphia being coordinated by Play on Philly! including a performance at the Curtis Institute of Music. If you were able to attend our collaboration last season with Mozawa and Ho Etsu Taiko, then you will be excited to hear that we are currently working on another project for Summer 2015! In case you don't already have a copy, don't forget that our CD, Soirées d'été, is available on iTunes and CDBaby. For info and tickets click here. Admission is free. Suggested $10 donation for adults and $5 for children. More information and ticket click here. As part of our educational goals, the Chicago Harp Quartet directs and manages the Chicago Harp Ensemble. The ensemble is made up of some of the best young harp students in the area from many different private harp studios. The students work together to learn important ensemble skills which harpists do not usually have much exposure to at a young age. Along with learning important skills, the students also have a great time creating friendships and a harp community for the City. The Chicago Harp Ensemble, will have its winter concert on Thursday, December 4th, 2014 at 7:30pm. The concert will take place at Lyon and Healy Hall, located at 168 N Ogden ave, Chicago IL 60607. This concert is free and open to the public, so please come support our young student harpists!